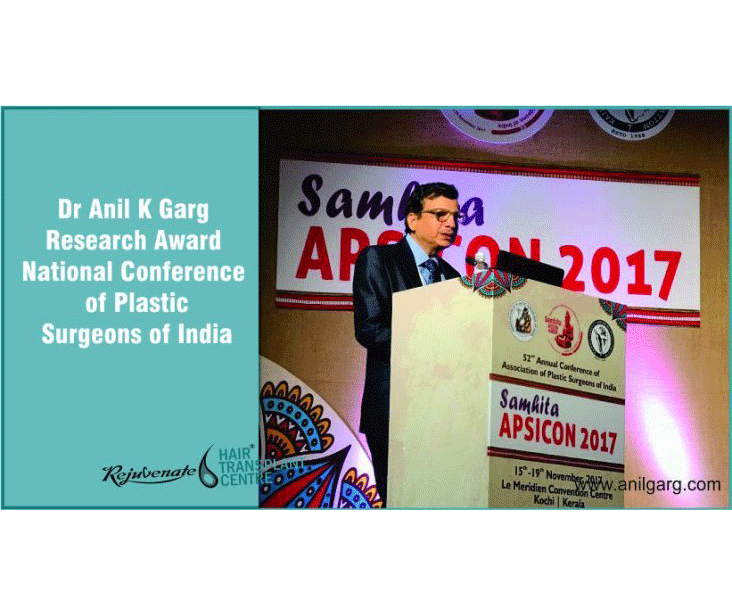 Dr Anil Kumar Garg has been awarded the most prestigious award by Indian Association of Plastic Surgeons of India during the annual conference held recently at Kochi. This is called Dr Sam See Boss Research award given to research scholar who does original research in the field of Plastic Surgery. Dr Garg has done research on the use of Autologous plasma as graft holding solution and its clinical efficacy. He did three years research on the human plasma and found the use of plasma as holding a solution for hair follicles is highly beneficial and it increases hair growth and thickness after a hair transplant. This research was also awarded by the association of hair transplant surgeons of India as the best innovation award. Dr Garg presented his work last year in the International Congress of the international society of hair restoration surgeons held in Las Vegas. This year he was invited to present and teach his work in the annual congress of the international society of hair restoration surgeons in Prague. Dr Garg also organizes a Hair Restoration Session in APSICON 2017 at Kochi. In this session, three days master class and one symposium on hair restoration were done by eminent hair restoration surgeons of India. This session was aimed to teach young plastic surgeons who wish to practice hair transplant. This event took place for the first time in APSICON with the maximum number of the attendee and marked as most successful master classes of APSICON.